In accordance with the policy set out in Emergency Motion E8, which Branches will recall was carried at this year’s CWU General Conference, the purpose of this LTB is to provide branches with a report on the review of the Postal Executive election arrangements which has now been completed and to provide branches with the conclusions, recommendations and proposed rule changes which the NEC have agreed upon. Branches will recall that we have previously addressed this issue in the following LTB’s, 339/15 dated 15th May 2015 and 478/15 dated 16th July 2015. Conference recognises that the ballot paper used for the election of Postal Executive Committee (Postal Grades) members 2015 contained changes to the number of candidates members were entitled to vote for in comparison to previous elections. This may have inadvertently caused uncertainty for branches when making recommendations and for members when recording their vote. Therefore in order to protect the integrity and reputation of the CWU there is now a requirement to re-run the ballot for the 2015 Postal Executive Committee (Postal Grades) positions only. The NEC are therefore instructed to re-run ballot for the Postal Executive Committee (Postal Grades) positions at the earliest possible opportunity and to publish the revised balloting arrangements to branches by no later than May 2015 with a view to concluding the re-run ballot by no later than July 2015. Additionally the NEC is instructed to conduct a comprehensive review of the relevant union rules and election regulations to ensure that there is no uncertainty regarding any future Postal Executive elections. The review will be concluded by August 2015 and a report containing the conclusions, recommendations and proposed rule changes to be submitted to the 2016 Rules Revision Conference will be published to branches by September 2015. As can be seen above E8 contained 2 specific instructions for the NEC to progress, these being the re-run of the 2015 Postal Executive (Postal Grades) ballot and to conduct a review of the relevant election rules and regulations. In respect of the re-run ballot LTB 339/15 dealt with this issue and the result of the re-run ballot was declared in LTB 478/15. This completes the policy instruction contained in paragraphs 3 and 4 of E8 and in accordance with the election regulations for this ballot we have received no further complaints or correspondence and accordingly this particular element of E8 is now concluded. The working group met on the 7th July 2015 and prior to the meeting the group were provided with a discussion paper drawn up by the SDGS that laid out options that could be adopted in future when dealing with Postal Executive elections. Again for ease of reference and completeness I have attached a copy of that discussion paper to this LTB. The meeting proved to be very productive and the options contained within the discussion paper were debated at length, however the working group did not reach a consensus and in any event at the time we also needed to understand any implications that may arise from the adoption by the Postal Executive of a new IR structure in The Post Office (POL) that was in the process of being placed before the PE for endorsement. This agreement made reference to PE members from The Post Office serving on a National Consultative Committee and we needed to establish if this would introduce further reserved seats, additional to those for PTS grades, before we could finalise a position on the issue of future PE elections. Following discussions with Andy Furey, Assistant Secretary Postal, it was established that there will not be reserved seats required as a result of the new IR agreement. As such we remain in the same position as we did prior to commencing this year’s PE ballot. Given that the working group did not reach a consensus the NEC has agreed that the most straightforward way to deal with this matter is to report that in future when we issue a notice informing Branches of the candidates in each respective election that we also inform them of how many votes members will be entitled to cast in each election. This would ensure that Branches will know, prior to ballot papers going out, what wording will appear on the ballot with regard to the number of votes that can be cast along with an explanation as to why i.e. with an explanation of the rules concerning the number and makeup of the PE. The above policy was agreed by the NEC at their meeting on 24th September 2015. In conclusion we believe that if we could have adopted this approach prior to ballot papers going out for 2015 PE elections then there would have been no complaints and no requirement for us to have submitted the Emergency Motion. Whilst this is a matter of regret the purpose of the motion carried at conference was to look to the future and ensure no repetition. In the absence of a firm view to make wholesale change, some of which would need a more wide ranging discussion around the composition of the PE than the timescales within E8 allows, the NEC believe the position set out above is the correct one. The above process will mean that branches will know prior to any ballot papers going out for the next scheduled PE elections (2017) exactly how many votes their members are able to cast. This will enable Branches to advise their members accordingly and arrange whatever publicity they feel is necessary to vote for the number of candidates they may wish to recommend. Obviously if there is any change to the composition of the PE before 2017 there would be a need to revisit this issue. Likewise we will monitor the 2017 election process closely as part of an ongoing review of this issue. Further to the above I will ensure that we introduce revised protocols within my department to ensure we do everything within our power to avoid any similar situations from arising in future elections. This is a reminder that we have the National Youth Education Event taking place from 30 October to 1 November at Aston University in Birmingham. The timetable is coming together really well and we are looking forward to a variety of debate and discussion on a number of different areas including: ways to improve the living standards of those in the private rental market, civil liberties especially in relation to the proposed Civil Bill of Rights, Blacklisting – the constant battle of belonging to trade unions without it hindering employment, football fans increasingly are finding it more and more outwith their financial capabilities to support their team; what can be done to encourage clubs to make it more affordable? We are also organising a “big debate” session on the argument for and against staying in the EU – this should be a lively debate and will hopefully encourage the delegates to get involved. Again, the industrial roundtables discussions will enable the delegates to speak directly to the DGS’ about what is happening relating to their workplaces and employers – always an event favourite. Dave Ward will give his first keynote speech on CWUYouth as General Secretary on the Saturday lunch-time. We will have a special appearance of Stephen Morrison-Burke who has kindly agreed to perform a set during the social event on the Saturday night. Branches are asked to encourage young members to attend and we ask that applications are submitted asap to ensure places (a form is attached for ease of reference along with a copy of the draft timetable). If branches need advice on this they should get in touch with my office by email to Jo Thair (jthair@cwu.org) and we will try and assist in any way we can. The Equal Opportunities Department has been promoting BHM for a number of years, celebrating and remembering the vital roles played by prominent members of the BAME community. Our Union has been advocating our pull-up exhibitions, which cover four different equality strands. For the purposes of black history, we have developed a number of pull-ups which together amounts to an excellent exhibition that Branches are free to use (subject to conditions). 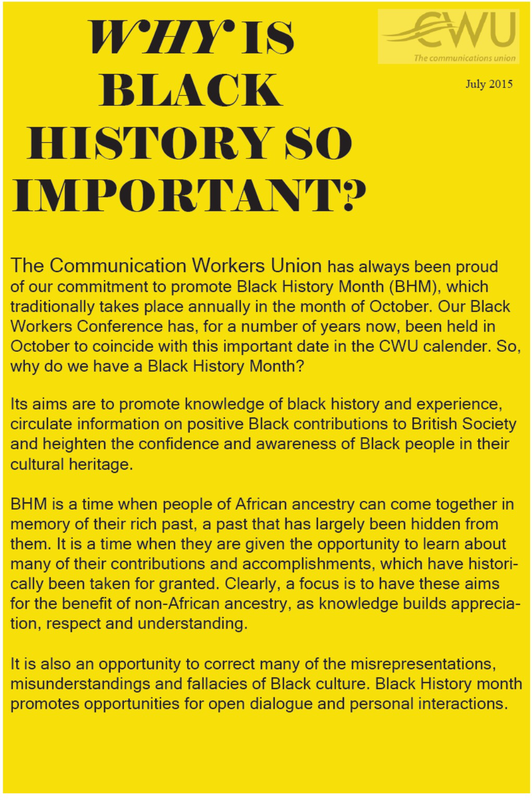 Attached is a new flyer that gives some background linked to BHM and we hope that Branches will encourage the promotion of black history initiatives during the month of October. The flyer is available to download from the Equal Ops section of the CWU website. At the last General Election, UKIP polled almost 4 million votes. Fortunately, this transcended into just the solitary MP. The negative rhetoric of UKIP, which almost always scaremongers around immigration, does nothing to bring cohesion to the vibrant multi-cultural communities that thrive throughout the UK. 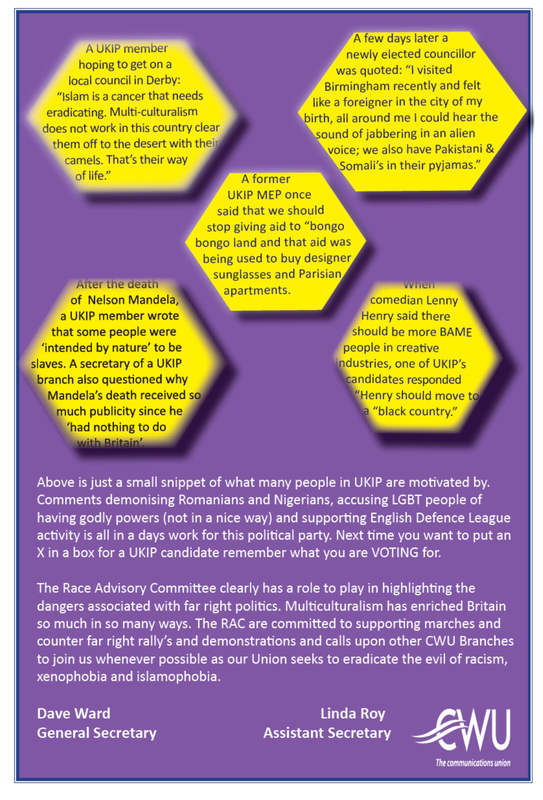 The RAC have been keen to highlight the dangers of the far right and it has been very committed and persistent in attending anti-racism and anti-fascism rallies across the country. It is clear that a number of CWU members have felt alienated by their MPs or certain political parties and subsequently voted for Nigel Farage and his far right scaremongering ideologies. Part of this initiative is to educate CWU members around the reality of what UKIP stands for. 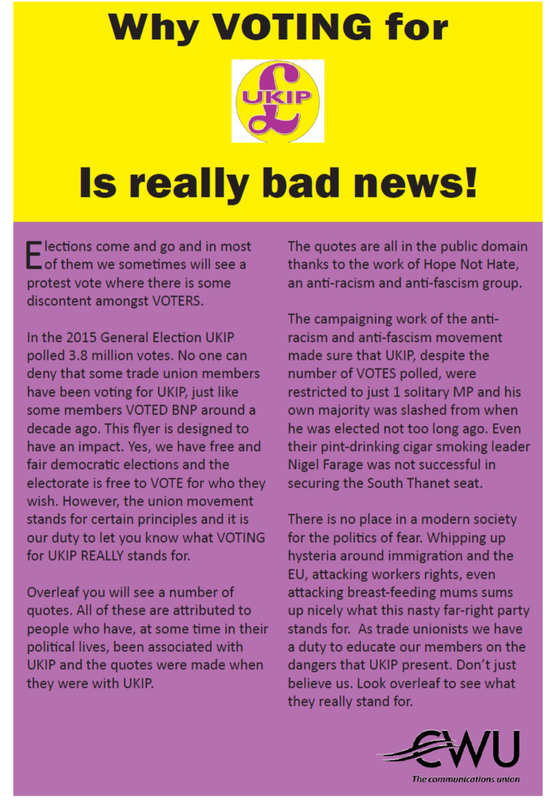 The flyer effectively draws attention to the numerous faux pas that representatives of UKIP have been responsible for. It is important that our members know what they are casting their vote in support of. The CWU are affiliated to Unite Against Fascism and Stand Up to UKIP and we will continue to oppose their intolerant and bigoted policies. I would like to remind Branches that we that we are still seeking nominations for the Ken McKenzie Award for Lifelong Learning. The annual presentation of the Ken McKenzie award was mandated by Annual Conference in 2010 and is presented to a ULR (Union Learning Representative) or group of ULR’s who have made a significant contribution to lifelong learning within the CWU. The award will be presented at the CWU ULR National Networking Event in November 2015. Last year it was awarded jointly to Nick Bury and Liz Phillips and as usual we received a good number of nominations of a very high quality. I am now inviting applications from Branches for the 2015 Annual Ken McKenzie award for lifelong learning. The award will be made in recognition of exceptional achievements and contributions to lifelong learning by a CWU ULR or a group of CWU ULRs. Nominations can be made by Branches, Regional Learning Committees or Regional Committees by completing the attached nomination form. The closing date for nominations will be FRIDAY 9TH OCTOBER 2015. The presentation of the award will be made at the Annual CWU ULR Event on 24th and 25th November 2015 in Nottingham. Credential cards for delegates/visitors and voting cards for this conference will be issued on the Saturday morning at registration prior to the conference opening. Further to LTB 555/15 Branches and the proof of concept trial in 6 Delivery Offices Derby, Chesterfield, Leeds, Worksop, Kidderminster and Knutsford across the East, North and West areas we have now concluded our post trial discussions with Royal Mail and reached agreement on the above. The National Agreement is designed to improve driver safety and a reduce road traffic accidents. The main monitoring element of the system is to achieve a 10% MPG improvement, and as such the technology will be fitted to approximately 13,000 vehicles in approximately 1300 locations across the UK. We have agreed and included in the National Agreement that all individuals have a right to privacy at work and jointly accepted that there is an obligation on both parties to sustain confidence and trust in relation to all employees, and that we should act in a way to engender that type of relationship. Accordingly the driver performance data will remain confidential to the individual and will not be displayed on notice boards or in league tables, nor will it form part of performance management. It is also agreed that this technology is not being deployed for use as a disciplinary tool or a source of information to be used in conduct cases. The CWU will be fully involved in the deployment at all levels which we have agreed is essential if the full benefits are to be realised. This will include all aspects of the initiative including implementation, monitoring, assessment and profile adjustment where agreed necessary. It will also include training opportunities for a number of nominated CWU representatives, providing them with a system overview. Full training will be supplied to all employees who will be required to use the new technology, and the training package will be agreed in full with the CWU before the system is switched on. The proposed go live date is 5th October 2015. The agreement will be the subject of joint review 6 months after deployment and periodically thereafter. The installation of the technology/devices is still expected to be finished during November 2015. Branches will be updated of further developments. CWU Area Delivery Representatives will recall the ADR briefings that took place during July 2015 and the presentations and discussions that took place. Due to the voluminous nature of the presentations and documentation it was not possible to circulate these via an LTB. Consequently we have now arranged for the documentation to be made available via the link below. The documents available include the following in numerical order. 1. Compact Large Letter & Letter Sorter Presentation. This is a presentation to the CWU regarding the above mentioned machine trial that took place earlier in the year and included the impact on Sidmouth Delivery Office. 2. CUPW Canada Post Presentation – Work Life Balance. This is a comprehensive study/report commissioned by the Canadian Union of Postal Workers to look at the impact of Transformation and its affect on work life balance and its members. 3. Norway Post Presentation – New Delivery Structure – Royal Mail Visit. This is a presentation made by the Norwegian Postal Operator to the CWU and Royal Mail on the visit to Norway earlier this year illustrating how they implemented a new Delivery Structure. This is a report on Postal Operator Efficiency commissioned by OFCOM. This is a document produced by Solystic promoting the use of mail merging technology. This is a document produced by Solystic promoting the mail merging machine (Letters & Flats) that they have produced and is the technology trialled in document 1 above. These are slides produced by the CWU following the visit to Norway showing the equipment introduced and used to support the new delivery structure. This is the LTB released in February detailing the OMP trial and the agreed terms of reference being used for the trial. These are simply notes/bullet points covering what we saw in Norway & Sweden mainly from a H&S perspective. This is a report we requested from the Research department to support our involvement in the OMP trial and to provide some comparisons with other Postal Operators. Some of this information is included in the WIK report. These are simply notes/bullet points covering what we saw in Norway & Sweden from an operational perspective. These documents are being provided to enable debate and discussion within Branches, within CWU committees, between CWU representatives and between them and our members. They are not at this stage providing any direction or influence. They are there to provide information on what is happening in the Postal Industry and for consideration to be given to what we want our future to look like bearing in mind what is going on around us that will also influence the future of all Postal Operators. Further ADR briefings are being held in October commencing on the 21st in Edinburgh and we would like discussions/consultations to have taken place before these events take place to feed back the views of our representatives and members so that we can broaden the debate and hopefully in the new year broaden the number of participants. Any further documents produced by us or that become available from others that will add to the debate/discussion will also be circulated. The CWU have raised concerns over the amount of time it is taking for the business to conclude the current VR exercises and have stressed that we will not enter into any further negotiations on VR’s until the current exercises have been concluded. We have also raised concerns on the length of time it is taking to complete the 25 Saturday only Casual Conversions the CWU have agreed under the Job Security Agreement. Management will make enquiries to HR and report back at next weeks meeting. The CWU will commence negotiations with Management over the Processing duty structure now that the Production Control Manager is back from annual leave. The Part time staff who have recently been successful in increasing their contractual hours on a temporary basis to either full time or 24 hours will continue throughout the Christmas and New Year period with a review planned at the end of January. Management are adopting the same practice as last year for the Christmas Pre-scheduled overtime volunteer sheets. Instead of using the old system of books on display for staff to fill in, once again each member of staff in Processing, Distribution, Revenue Protection and the Print Site will receive their own individual sheet to fill in and return to the book room. The forms will be sent out next week (Processing Staff will receive their forms in the same envelope as the Annual Leave Pick Forms) Staff in Deliveries and Administration will have to go to the book room to get a form if they wish to volunteer for Processing pre-scheduled overtime over the Christmas pressure period. The last date for the forms to be returned to the book room will be the Friday 23rd October 2015. This will give the part time staff who are successful with their applications to go full time over the Christmas pressure period (closing date 7th October) the time to complete their forms after being notified what their temporary full time hours will be. Management have asked for members of staff who can complete their forms before the 23rd October to give them to the book room ASAP so the book room staff can start entering the information onto the computer worksheets. The 2016/17 Processing Annual Leave Agreement has been agreed and signed off today. A copy is on display on the Union Board. Members are advised to read the agreement in preparation for their leave pick of which the letters will be going out to staff next week. Last years paragraph 2.4 has become this year’s 2.6 and there are two new paragraphs have been added to this years agreement 2.4 and 2.5, there has also been an amendment to paragraph 8.3. The return date for Annual Leave Pick Forms will be Friday 23rd October 2015. An advert is on display for members of staff who are interested in being trained to operate the new Tug when it is introduced into the Mail Centre to apply in writing to the book room Manager. There will be a demonstration of the Tug’s manoeuvrability on Monday 28th September at 10.00am. A Royal Mail/CWU Nationally Agreed Joint Statement on the introduction of the Flip Flops will be released on Friday 25th September. Deployment of the equipment in the mail centre will start from Saturday 26th. Management are anticipating the use of the equipment will make a 30 hour per day saving in the DSA area. The Divisional Reps have asked for a list of all untrained Reps on the New Conduct Code which I have sent them. We are still awaiting training dates for the Processing Reps. There is a notice on the union board advertising the Branch Election timetable for positions from March 2016 to March 2018. All positions in the branch, Officers, Area Reps, IR and H&S Shift and substitute Reps on all shifts in all functions are up for nomination.